One of the best hot hatches just got better. The Ford Fiesta ST is widely regarded as one of the most fun and affordable hot hatches on the market, so it was disappointing last year's current-gen Fiesta didn’t include a performance ST model in the range. We’ve been pining for the ST to return ever since. Mercifully, Ford has filled the void and revealed the all-new 2018 Fiesta ST ahead of its official debut at Geneva next month. As was widely speculated, the new Fiesta ST is ditching the four cylinder, 1.6-liter turbocharged unit of the current model. In its place is a three-cylinder, 1.5-liter Ford EcoBoost engine. Before you get too alarmed about hot hatch having one less cylinder, the 2018 Ford Fiesta ST is no less potent. Its “all-new” engine produces 197 horsepower and is good for 214 lb-ft of torque, allowing it to sprint form 0-60 mph in 6.7 seconds. It’s worth noting, however, that this only applies to the European model, since Ford hasn’t announced if the North American version will get the same setup. 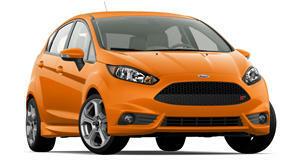 For comparison, the current standard 1.6-liter turbocharged four-cylinder Fiesta ST churns out 180-hp and 177 lb-ft in Europe, while the standard North American model produces 197-hp and 202 lb-ft.
Ford says the new 1.5-liter EcoBoost engine is loaded with technology including turbocharging, high-pressure fuel injection and Twin-independent Variable Cam Timing to deliver “optimized performance and fuel efficiency”. The EcoBoost engine also has what Ford claims is an industry-first cylinder deactivation system for a three-cylinder engine to improve efficiency without sacrificing performance. In conditions where full capacity is not needed, the system can disengage or re-engage one cylinder in 14 milliseconds. Torque Vectoring Control should also make it a hoot to handle, by applying brake force to the inside front wheel when cornering to reduce understeer. For the first time in the Fiesta ST, users will be able to select from one of three drive modes to fine-tune the hot hatch for different scenarios. The available Normal, Sport, and Track settings affect the Electronic Sound Enhancement and active exhaust noise control valve to make the hot hatch sound more savage if you thrash it around a track. Each setting also affects the throttle mapping, steering, and stability control. The new Fiesta ST looks great too, distinguishing itself from standard models with an aggressive race-car-inspired mesh grille, new bumpers, a roof-mounted spoiler and exclusive 18-inch alloy wheels. Inside, the Fiesta ST features Recaro seats and a flat-bottomed steering wheel, and Ford is promising a wealth of interior customization options too. To demonstrate the hot hatchback's handling capabilities, Ford released an unusual promotional video featuring the Fiesta ST being driven by WRC driver Toni Kelly against a bike stunt performer. Fun, powerful and adaptable, you can't really ask for much more from a hot hatch. The new Fiesta ST will be formally introduced to the public at the Geneva Motor Show next month, where it will face stiff competition from the US-bound Honda Civic Type R and the supercharged Toyota Yaris GRMN. No launch date has been announced for Europe or North America yet.